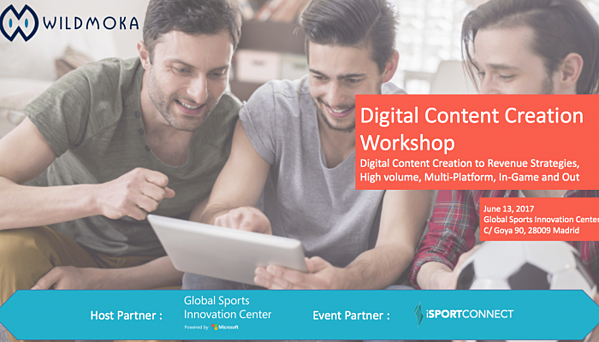 Wildmoka, the leading Digital Content Creation Platform Provider announce its first Workshop in Spain, in partnership with iSportconnect and the Global Sports Innovation Center. In this session, we will discuss how to face those new challenges and ensure the capture of maximum engagement and revenue opportunities. This workshop will bring together professional involved in content creation, branding and publishing in the digital environment, whether in the context of OTT, fan engagement, digital marketing, social media, mobile live experience. Wildmoka provides a cloud video platform with tools designed for instant video clipping, editing and publishing from any video stream, to any destination. Specifically, for sports, the new Wildmoka Automated Content Creation Platform, provides a complete automated work ow, enabling content owners to automatically create and push near-live highlights and summaries. Wildmoka’s unique technology detects in real time the best actions of a Live sports event, and allows clients to extract, tag, and publish clips immediately to any destination. The company is based in the EU, the US and APAC, and is trusted by several customers such as FOX, CANAL+, TF1. Global Sports Innovation Center (GSIC) has a primary goal of improving the value chain of the Sport industry by leveraging the most advanced technologies, enabling business connections, and becoming a worldwide reference for the sports industry, from start-ups to enterprise organizations. Located in downtown Madrid, the center provides technology services, solutions and programs that meet the needs of many audiences, including students, entrepreneurs, governments, and industries. iSportconnect is the largest global private network of Sport Business Executives where membership is exclusive and follows a strict door policy. The network was launched with the aim of bringing together sports business professionals around the world in a global sports business community enabling them to meet one another, share viewpoints, find information and obtain access to a wide range of relevant services. It is a one-stop platform for any quintessential Sport Business Industry executive.